The exact origin of the variety is the Gironde in the southwest France where it has never been grown on a larger scale. Frequently she was with Sauvignon Blanc and Sémillon grown together. Today there are only more leftover stocks and they do not seem to be in the statistics anymore. The parentage is unknown. According to DNA analysis it is not a direct descendant of Sauvignon Blanc, as one might suspect on the basis of the name. According to DNA analyzes made in 2012, she is a parent of Saint-Pierre Doré, The early to mid-season, high yielding vine is prone to Botrytis. bunch rot. Esca and both mildews, It produces golden yellow, flowery white wines with aromas of herbs, citrus and almonds. They are considered less aromatic, but body and alcohol rich than those from Sauvignon Blanc. The variety was introduced to northern Italy (Friuli) in the early 19th century and long referred to as Tocai . With the name one wanted the popularity of the Tokaj exploit. 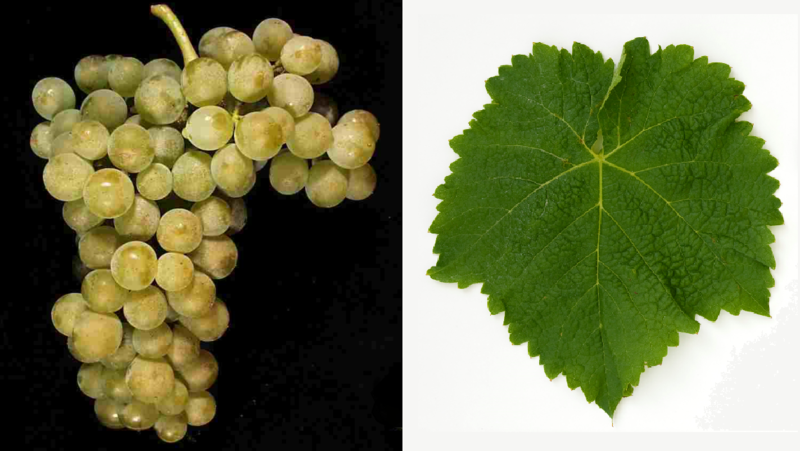 According to one hypothesis, the variety should Hungary come and with the Tokayersorte Furmint be identical. This was allegedly introduced by a count Ottelio di Ariis in 1863 in Friuli. A second hypothesis took the opposite route, namely that the variety was brought to Hungary by a family of Formentini from Friuli. And according to a third hypothesis, in the 13th century the Patriarch Bertoldo di Andechs sent Tocai cuttings to the Hungarian King Bela IV (1235-1270). But the variety has nothing to do with the Furmint. The Ampelographer Pierre Galet (* 1921) had long been equated with Sauvignonasse, which was confirmed by 2003 DNA analyzes. The Ampelographer Giovanni Dalmasso (1886-1974) suggested in the 1930s as the name Tocai Friulano to a confusion with the Tokaj to avoid. But that did not agree with Hungary. After long legal disputes, there was an EU decision in 2002, the name Tocai Friulano could only be used until 31 March 2007. On the other hand, the Italian authorities allowed the winegrowers of Friuli to market their Tocai from the 2006 vintage again with this name. The reason for the controversial approval was the laborious search for the future name of the grape variety or the wine. For years, the winemakers had not been able to agree despite the approaching ban. Now, the grape variety in Friuli-Venezia Giulia only Friulano briefly, in Veneto, however, Tai (the Japanese-like name was created by omitting the letters "oc") and only in the DOC area San Martino della Battaglia Cloth . The variety is in Italy mainly in Friuli-Venezia Giulia but also in many other regions like Lazio. Lombardy and Veneto grown. She is among others in the DOC / DOCG wines Bianco di Custoza. Breganze. Colli Euganei. Collio Goriziano. Colli Orientali del Friuli. Corti Benedettine del Padovano. Friuli Annia. Friuli Aquileia. Friuli Grave. Friuli Isonzo. Garda. Lison. Lison-Pramaggiore. Merlara. Piave. Riviera del Brenta. Rosazzo and San Martino della Battaglia authorized. The acreage in Italy totaled 2,911 hectares in 2010. In Slovenia (with a stock of 190 ha), there were similar name problems as in Italy. At first the name Točai was proposed, which was not recognized by the EU as in Italy. The name Friulano is not used in Slovenia. The name Zeleni Sauvignon is not accepted by all winemakers and the wine marketed under fancy names such as Gredic, Jakot or Pikotno. There are more stocks in Russia (48 ha), as well as in Argentina (515 ha) and Chile (785 ha). In 2010, a total of 4,449 hectares were reported. The variety thus came under different names in the world varieties ranking the rank 117. This page was last modified at 26 December 2018 at 16:34.